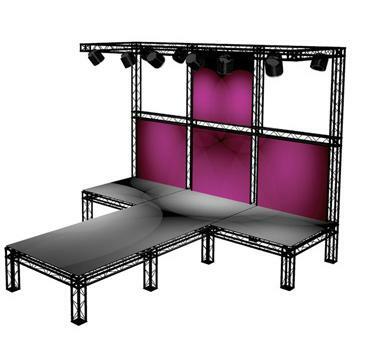 200m2 Exhibition Stands, the UK leader in modular exhibition stands and exhibition services, has announced a new modular concept called TECHwire which is specifically designed for large scale applications such as stage shows or catwalks. Made from a composite outer material with an aluminium core, TECHwire is extremely strong yet lightweight. Consequently, it is extremely cost effective to transport around the world. For applications like concert stages for example, TECHwire is set to make an impact both visually and in terms of reduced transportation costs. TECHwire is made from the same outer material as 200m2’s other modular concepts called TRUSSwire and CROSSwire. As its name suggests, TECHwire is a technological innovation which combines strength and lightweight composite materials, to create a weatherproof and scratch resistant gantry system which can be re-used time and time again. Like its smaller counterparts TRUSSwire and CROSSwire, TECHwire is extremely easy to build and break down. Measuring 25cm by 25cm across, TECHwire is available in a variety of different lengths from 25cm to 200cm. Compatible with all forms of media (lighting, sound, visual etc), TECHwire is expected to revolutionise the large scale event management industry. For more information on TECHwire, including exhibition stand hire options, call +44 20 3332 0092. Previous Previous post: QR Codes For Exhibitions? Next Next post: Exhibition Furniture Hire: Our Top Tips!